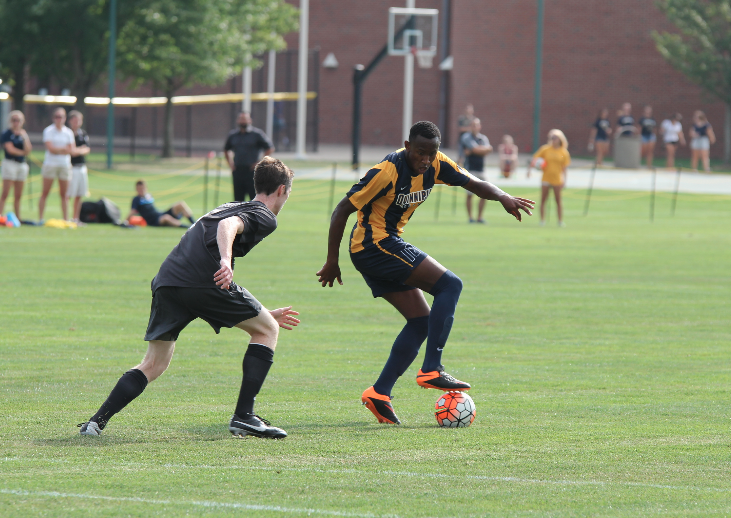 Creating scoring chances and putting shots on net has been one of the central issues for Quinnipiac’s men’s soccer team in the first few games of the season. The Bobcats were outshot 10-3 against Boston College in the season opener, and 12-5 against UConn on Monday. Today’s home opener against Brown University was no different, as head coach Eric Da Costa’s squad was outshot 18-7. Out of those seven shots only three shots reached Brown’s keeper Erik Hanson, whereas Quinnipiac’s goalie Triston Henry saw 12 shots come his way. The Bobcats are still looking for their first goal of the season, and lost to Brown 2-0, but Da Costa has complete confidence that things will pick up. Da Costa went on to talk about the handful of players that they are trying to work back into the lineup. Senior defender Stevenson Hawkey missed most of last year due to a leg injury. Senior and junior defenders Erik Panzer and Mikail Ellis are rotating in and out of the lineup, and Henry is still feeling out the role of the starting goalie. Freshmen defender Oscar Evans and midfielder Colton Grob are also being worked into the lineup and already making the strides that their coaches are looking for. Da Costa said it will take time to get the offense to where it needs to be, and that as long as everyone remains patient, everything should come together. Quinnipiac has a week off until they travel to Rhode Island next Saturday to play URI. Da Costa said they would be using the upcoming week to rest up, study film and get more familiar with one another on the field.